Writing has changed due to the affordances of digital technologies, and writing assessment has changed as well. As writing programs integrate more digital writing work, students, teachers, and administrators face the rewards and challenges of assessing and evaluating multimodal and networked writing projects. Whether classroom-based or program-level; whether in first-year writing, technical communication, or writing-across-the-curriculum; whether formative or summative; and whether for purposes of placement, grading, self-study, or external reporting, digital writing complicates the processes and practices of assessment. How do different approaches to assessing traditional writing (8 1/2 x 11 word-centric texts) port—or not—to the assessment of digital writing? What challenges and opportunities for assessment do multimodal, networked texts present to teachers, program administrators, state-wide organizations, etc.? What material and technological resources are needed when assessing digital writing and/or how might existing resources need to be modified? How are processes and products of selection, collection, and reflection different (or not) with the multimodal affordances of digital technologies? How do guidelines and outcomes of groups such as CCCC, NCTE, WPA, AAC&U, impact approaches to assessment? How might these guidelines and outcomes need to be revised to better address digital writing assessment? How might the multimodal, networked affordances of digital writing affect issues of equity and access? How might groups often disenfranchised by more traditional assessment be impacted by digital writing assessment? How might eportfolios be designed for showcasing the collaborative composing processes of multimodal and/or networked writing? By what criteria should program administrators and instructors assess and select course-management and/or eportfolio systems? The fourteen chapters are organized into four sections, addressing equity and assessment, classroom evaluation and assessment, multimodal evaluation and assessment, and program revisioning and program assessment. Andrea Lunsford provides the foreword to the book; Edward White is the author of the afterword. McKee, Heidi A., and Dànielle Nicole DeVoss DeVoss, Eds. 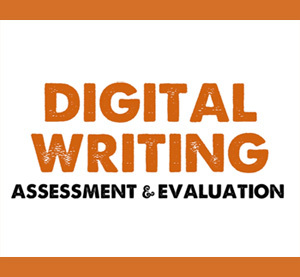 Digital Writing Assessment & Evaluation. Logan, UT: Computers and Composition Digital Press/Utah State University Press, 2013. Web. Copyright © 2013 Heidi A. McKee, Dànielle Nicole DeVoss, and Utah State University Press/Computers and Composition Digital Press. Some rights reserved. For personal noncommercial use. Viewers may not reproduce this ebook or project or display it on another website. This does not affect any of the following rights: fair use rights; the authors’ moral rights; rights other persons may have in relation to either the work itself or how the work is used. Per U.S. copyright law, readers may, without permission, use limited portions of copyrighted work for the purpose of analysis, review, critique, parody, etc. All such use should be accompanied by appropriate attribution to both the author and the publisher. Requests for permission to use materials from this ebook or project in new publications should be directed to Utah State University Press on behalf of Computers and Composition Digital Press.